Contact our showroom designer. | Kitchen Cabinets and Design Kitchen and Bath remodeling. There are three other ways you can easily contact us. Or get directions by clicking here. Da Vinci Cabinetry proudly serves Southwest Florida with great products and services. Whether you are in the market for new cabinets or a complete Kitchen & Bath renovation, consider stopping by our showroom to meet us and see our work in person. We are confident you like our work. We also have on display some of our closet systems, tile work, countertops, and plumbing fixtures. If you are in the Naples, Bonita Springs, Estero, Marco Island, Sanibel, or Fort Myers areas, then give us a call today for a free estimate. We look forward to meeting you. Check Out Some of Our Past Projects! Our Customers Love Us… But You Don’t Have To Take Our Word For It! Check Out Our Reviews On Guild! 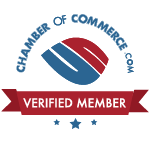 Proud Member of Chamber of Commerce. Please Check Us Out On Yelp!